The biceps tendon attaches the biceps muscles to the shoulder, providing leverage for lower arm movement. Tears or ruptures of the biceps tendon can occur from lifting heavy objects, falling on an outstretched arm or playing contact sports. 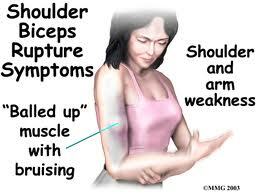 A torn biceps tendon causes pain and swelling. Many tears are the result of a wearing down and fraying of the tendon that occurs slowly over time. This naturally occurs as we age. It can be worsened by overuse – repeating the same shoulder motions again and again.Overuse can cause a range of shoulder problems, including tendonitis, shoulder impingement, and rotator cuff injuries. Having any of these conditions puts more stress on the biceps tendon, making it more likely to weaken or tear.